Finding your true birthstone color isn’t always easy. Some months have gems that can be multiple colors, and other months have multiple gems associated with them! 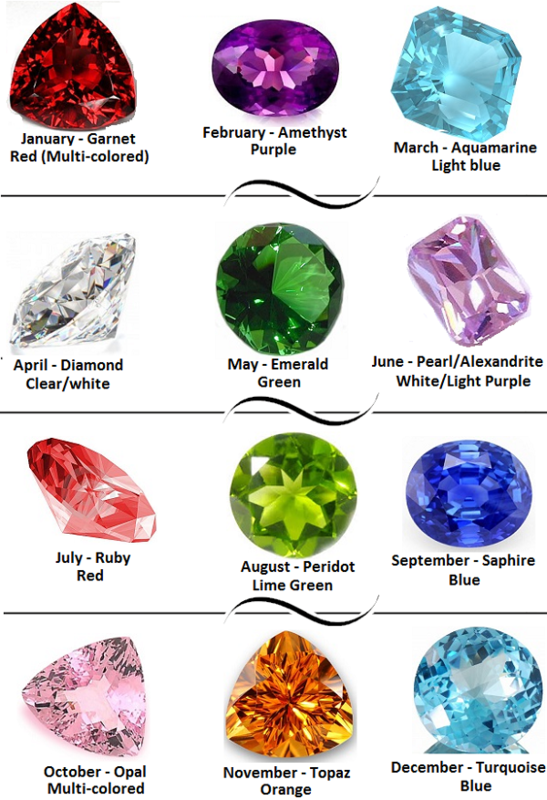 Below is a birthstone chart I made so you can more easily determine what your true birthstone color is. Did you know that birthstones have origins of almost 2,000 years ago? That’s right, all the way back in biblical times, man was associating these beautiful gems with the month of their birth. In Exodus we find the mention of Aaron’s Breastplate which was something worn by a high priest. The plate contained four rows of gems, each row containing three different stones. Each stone was a different type and color, each associated with different tribes. Each stone was set into the breast plate with gold, and the plate was attached to the person who wore it with golden chains. This breastplate, dating back to the 1st century is among the first accounts of birthstone use. Along with spiritual uses, birthstones also play a role in the 21st century manufacturing processes. In fact, many of the precious gems we use as jewelry serve as industrial equipment as well. Drill bits, saw blades, grinding blades, and even semi-conductors are all practical and modern uses of these gems. Diamonds are among the leading gems used for manufacturing because of their sheer durability. They are the hardest stone, and are very abrasive. This makes them very good at cutting and grinding otherwise impossible to cut materials. Other gems used include quartz, garnet, and rubies. Often times low quality, defective, or gems that are otherwise unusable in jewelry are used in the industrial process. As technology increases, growing gems synthetically in the lab has yielded perfect gems for manufacturing, as well as jewelry. Synthetic diamonds are one of the most popular lab produced gems, and have uses in machinery and are also popular for various jewelry items as well. Whether you’re searching for a gift for yourself or a loved one, or are just interested in the myths, history, and factoids about these beautiful gems we can all agree that they’re an important part of humanity. For tens of thousands of years, since the beginning of human existence, we’ve been creating elegant works of jewelry. Starting out with seashells, and eventually branching out to the magnificent polished gems we like to refer to as birthstones, jewelry is part of what makes us human. It’s a form of expression, a form of art, and part of what makes you…you.